What could be more flaunt-able than being able to share your game performances, records and scores with your friends and in particularly with the whole world. And if the game is Warcraft (or DOTA which happens to be a map for Warcraft) then there is no looking back. Warcraft already has a huge fan following and TweetCraft just helps these fans to make their Warcraft experience better. 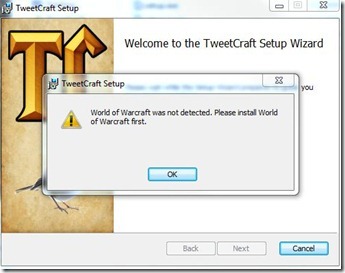 TweetCraft is an in-game Twitter client for World of Warcraft having a number of nifty features. TweetCraft lets you send/receive tweets in-game, queue tweets to send them may be after your game is over, upload in-game screenshots using TwitPic, automtically tweet about your instances,scores and achievements in the game. A video review of the client can be seen here. Since the client has capabilities of sending in game data to twitter, you need to have World of Warcraft installed necessarily. The client is a 1.42 MB download. There is also available another Add-on template on the downloads page. The client is an open source project which means developers can tinker around and produce new and better clients for the purpose.